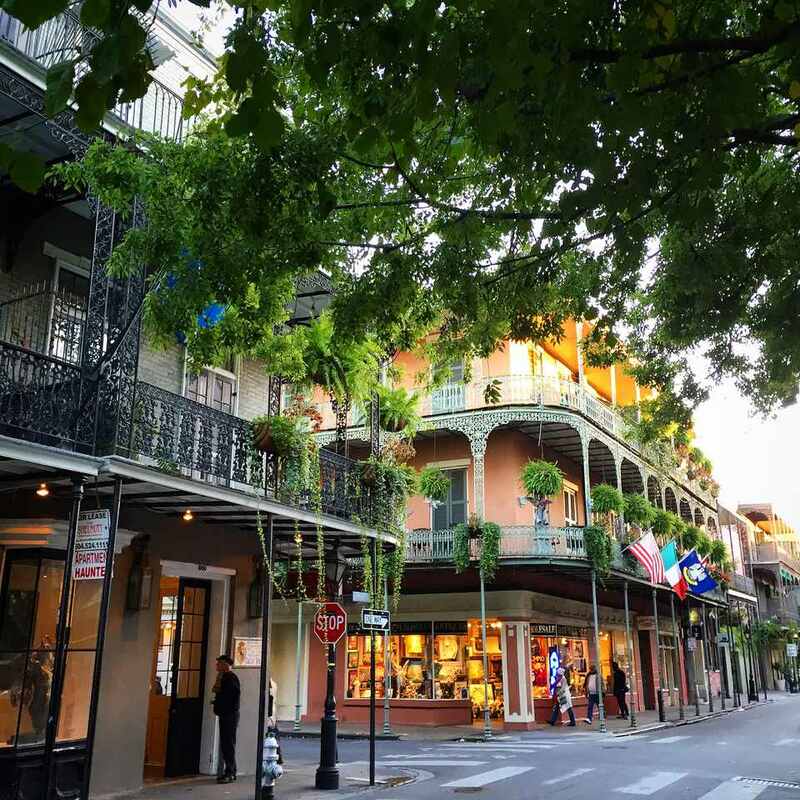 The first month of the year in New Orleans is a great time to visit: There's still a festive air lingering from the holidays, but the city isn't yet overcrowded with tourists visiting for Mardi Gras, which means that hotels and other attractions aren't as busy. Don't think the town is boring though—January has plenty of sporting events, art fairs, and Mardi Gras-kickoffs to keep you entertained. Plus, the mild temperatures make it an excellent month for spending time outside. New Orleans weather in January is generally mild, with high temperatures usually in the above 60 degrees Fahrenheit (16 degrees Celsius) and lows in the mid-40s (7 about degrees Celsius). Occasionally, warmer afternoon temperatures can rise just above 70 degrees Fahrenheit (22 degrees Celsius), with cooler mornings, very rarely dropping below freezing. Extremes as high as 83 degrees Fahrenheit (28 degrees Celsius) and as low as 14 degrees Fahrenheit (-10 degrees Celsius) have also occurred in past years. February receives an average amount of rain, typically around 4.7 inches spread across nine days. On a few days, rainfall can be more extreme, with up to .5 inch occurring on a single day. Snow is scarce. New Orleans' weather in January is quite similar to fall around the U.S. There will be a few colder days, so a medium-weight jacket is a good idea, as are gloves. In general, a light jacket or windbreaker will be plenty of warm enough. The Big Easy is a walking city, so don't forget comfortable shoes! Additionally, if you'll be attending a Carnival Ball, bring formal attire. January is a busy month in New Orleans, especially with the kick-off of Carnival season. In addition to parade season, the city also hosts several interesting arts, cultural, and sporting events. The Carnival season begins on January 6, which is also known as Epiphany, or the official end to the Christmas season. After this date, you'll see king cakes on sale everywhere, and the festive carnival balls begin. The Allstate Sugar Bowl is an annual college football event in the Superdome. It's held on January 1 and was first played in 1935. The Arts Market of New Orleans takes place on the last Saturday of every month. At this festive, family-friendly event held at Palmer Park, you'll find handmade art from local makers, ranging from ceramics and prints to canvases and soaps. New Orleans celebrates the Martin Luther King, Jr., holiday with a series of events, the most notable of which is a parade in Central City. The annual remembrance draws thousands and includes noteworthy speakers and performers. King cake is a New Orleans classic, especially during the Carnival season. If you're looking for the best, the King Cake Festival, held at the end of January, is a can't miss event. Bakeries from around the city serve unique twists on this Crescent City classic. The final battle of the War of 1812, the Battle of New Orleans, was fought just outside of the city. Each year, on January 8, more than 150 re-enactors gather on the Chalmette Battlefield to commemorate the victory over the British. January in New Orleans offers a big benefit: You beat the miserable humidity and stifling temperatures that can plague a summertime visit. Make your travel arrangements early. The city is popular year-round, especially on the weekends, and as Mardi Gras draws closer. Sporting events, like New Orleans' Saints football games, can draw exceptionally large crowds—which mean higher prices for hotel rooms and other attractions. Watch your bag and wallet when exploring the French Quarter or another crowded area. While these areas of New Orleans are generally safe, petty crime can happen just like any major urban area. New Orleans is a great dining city, but especially so for those looking to dine outdoors. Mild weather means that sitting on the patio, ideally listening to live jazz, is the perfect way to spend a sunny New Orleans afternoon. To learn more about when you will most enjoy a vacation to New Orleans, check out our guide to the best time to visit.